This article looks at contemporary Japanese nationalism in the context of growing far-right movements within democratic societies around the world, notably in Europe and North America, and the general rejection of the “happy globalization” narrative that has shaped the international order since the end of the Cold War. Japan, which witnessed the birth of the “borderless world” metaphor in the 1990s, is now contributing in its own way to the early twentyfirst century worldwide longing for strong borders and an aggressive military posture. The rise of ultra-conservatism in democratic societies cannot be reduced to a “Western problem”; by taking into account the political transformation of a country such as Japan it is possible to consider a truly global phenomenon with far-reaching consequences. Der 18. Mai erinnert seit 1980 an das Massaker der südkoreanischen Armee an der Bevölkerung von Kwangju. Just zu diesem Tag wurde von der LRB ein Auszug aus dem neuesten Buch des großen Korea-Kenners, Bruce Cumings, veröffentlicht. LRB hat uns erlaubt, einen Link zu diesem Atikel zu setzen. Darum hier nur zwei kurze Auszüge aus diesem großartigen Buch. "... North Korea celebrated the 85th anniversary of the foundation of the Korean People’s Army on 25 April, amid round-the-clock television coverage of parades in Pyongyang and enormous global tension. No journalist seemed interested in asking why it was the 85th anniversary when the Democratic People’s Republic of Korea was only founded in 1948. Ein Bekenntnis, das viele Jahre die Ursache für innerkirchlichen Streit und Unfrieden war. Es ist heute aufgenommen unter die Bekenntnisschriften der Kirche. Die Auseinandersetzung aber darüber geht weiter. Wir erinnern an Veranstaltungen vor 10 Jahren. Vor 10 Jahren, 2007, erinnerte der Kyodan nicht an das Schuldbekenntnis von 1967, das der damalige Moderator SUZUKI Masahisa in eigner Verantwortung veröffentlicht hatte, vielmehr machte das Wort von der 40-jährigen Wüstenwanderung (1967-2007) der Kirche die Runde und bestimmte die Beratungen und Gespräche des Kyodan (kurz für "United Church of Christ in Japan"). "Greetings from NCC-Korea! Today, we would like to share about the political climate in the Korean peninsula. We are worried about the military and the threat to peaceful existence of all living on the Korean peninsula. We are fearful that South Korea may be facing military occupation if tensions continue to rise and actions are being taken that are threatening and aggressive. So, we sent the following statement to South Korean media." Zur humanitären Katastrophe im Syrien-Konflikt: Was kann gewaltfreies Engagement hier noch ausrichten? Weiterlesen: 2017: Friedensethik - polit. auf verlorenem Posten? Ab- oder Nachdruck nur mit ausdrücklicher Genehmigung des Autors! ".... Kurz vor dem ersten Zusammentreffen mit seinem US-amerikanischen Kollegen hatte Chinas Außenminister Wang Yi die Situation in Nordostasien wie folgt beschrieben: Nordkorea sowie Washington und Seoul gleichen zwei Hochgeschwindigkeitszügen, die aufeinanderzurasen, ohne dass eine Seite auch nur ein Einlenken signalisiert. Follow Up on Thyroid Cancer! More than five years have elapsed since the great earthquake and the accompanying huge tsunami (on 3.11 of 2011), and its subsequent disaster at the Fukushima Dai-ichi Nuclear Power Plant of the Tokyo Electric Power Co. Three nuclear reactors there underwent explosions and another, though without explosion, was highly damaged. A large amount of radioactive material has been and is still being released as a result of the accidents. 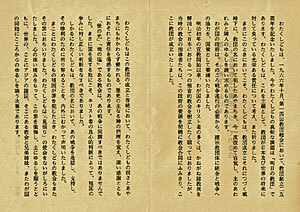 Aside from the very difficult issues of how to deal with the melted nuclear fuel rods and with the increasing amount of contaminated water, people all over Japan, particularly those in Fukushima prefecture, are concerned with the effects of radiation on human health from the released radioactive material.